Penguins aren't the only animals with problems. . . . A second hilarious collaboration from picture-book superstars Lane Smith and Jory John! Can you guess what's making this giraffe self-conscious? Could it be . . . HIS ENORMOUS NECK?? Yes, it's exactly that--how on earth did you figure it out? Edward the giraffe can't understand why his neck is as long and bendy and, well, ridiculous as it is. No other animal has a neck this absurd. He's tried disguising it, dressing it up, strategically hiding it behind bushes--honestly, anything you can think of, he's tried. Just when he has exhausted his neck-hiding options and is about to throw in the towel, a turtle swoops in (well, ambles in, very slowly) and helps him understand that his neck has a purpose, and looks excellent in a bow tie. Jory John and Lane Smith have truly outdone themselves in this companion book to Penguin Problems. JORY JOHN is a New York Times bestselling author and two-time E.B. White Read-Aloud Honor recipient. 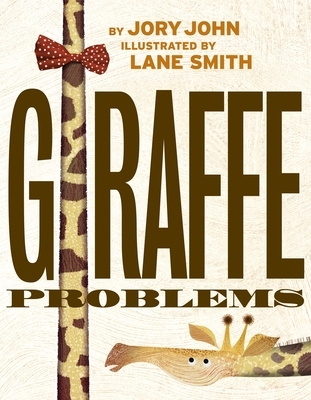 Jory's previous collaboration with Lane Smith was the national bestselling picture book, Penguin Problems, an Amazon Best Children's Book of the Year selection. Jory's work also includes the award-winning Goodnight Already! series, the bestselling Terrible Two series, the national bestseller All my friends are dead, and the recent picture books I Will Chomp You!, Quit Calling Me a Monster! and The Bad Seed, among many other books for both children and adults. He lives and works in Oregon. Find out more at joryjohn.com. LANE SMITH (also the illustrator of Penguin Problems) has written and illustrated a bunch of stuff, including Grandpa Green, which was a 2012 Caldecott Honor Book; It's a Book, which has been translated into over twenty-five languages; and The True Story of the Three Little Pigs! Four of his books have been New York Times Best Illustrated Children's Books of the Year. In 2012 the Eric Carle Museum named him an Honor Artist for "lifelong innovation in the field of children's books." In 2014 he received the Society of Illustrators Lifetime Achievement Award. Lane and book designer Molly Leach live in rural Connecticut. Visit him on the Web at lanesmithbooks.com.